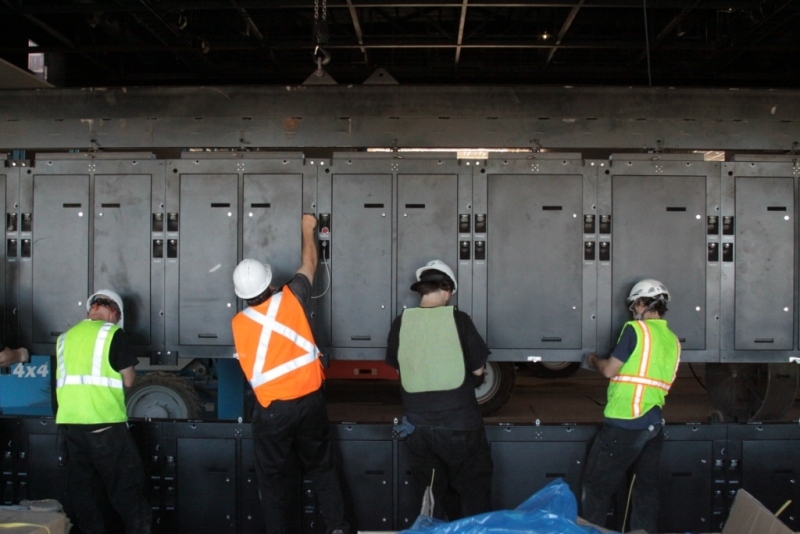 Atlanta-based Innovation Sports Marketing began installation of the main scoreboard in the new GCU Arena on Tuesday, adding another piece to a state-of-the-art facility that figures to rival some professional sports venues. The display itself is massive, hanging at the south end above the court. It measures 15 feet tall by 35 feet wide and weighs around three tons. It is put together from 60 panels or “cabinets,” with 12 cabinets across each of five rows. The scoreboard will hang in the center, and there will be two additional screens on either side of it. A ribbon board, which wraps around the top of the seating bowl, already had been installed. It’s a 12-millimeter product, which Bak says is unusual quality in such boards. The ribbon board and scoreboard will require as many as eight people for game-day operation, including a producer/director and camera and cable personnel. Gone are the days of pushing a button to change the score on a standard “Home” and “Visitor” board. The new board will have concert uses as well. Bak is being assisted on the installation by his niece, Kinsey Bak, who is an intern this summer with his company.